I got the idea to make this when I stumbled upon Olivia Wilde's recipe on The Kind Lifes website. I did use her recipe but I also made a few changes here and there. Bolognese originated in Bologna, Italy, ( go figure hehe ) is another one of those recipes that traditionally is made with meats of all types. 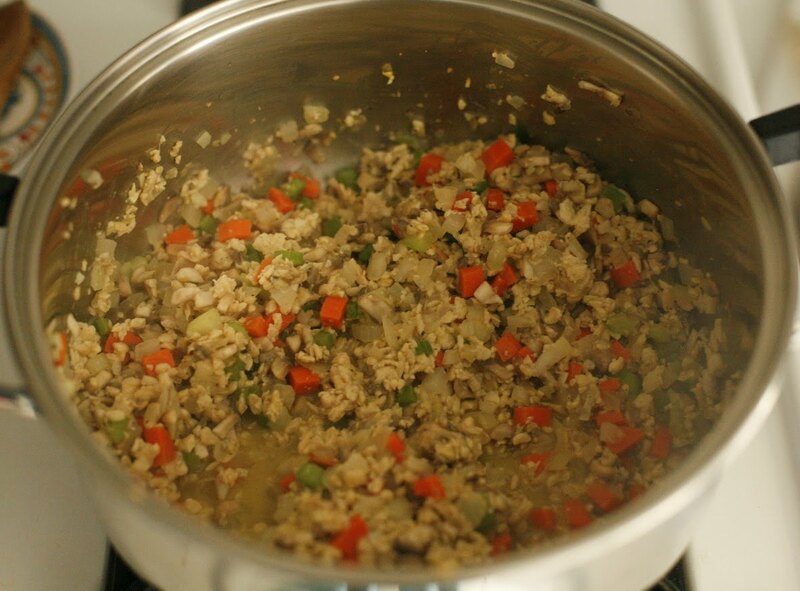 Olivia suggested using shredded tempeh and mushrooms in replacement of the meat. It worked well and as you might already know, I only love tempeh when it's shredded. Very different in texture when it's broken up in tiny bits, than when left as one big block. 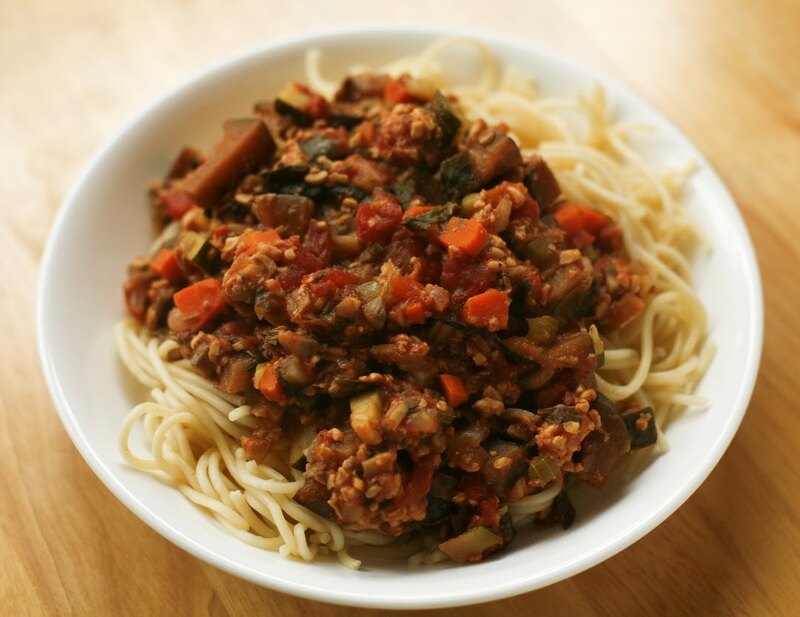 The Bolognese is so hearty and filling that if you're watching your carbs, you can leave out the spaghetti noodles. 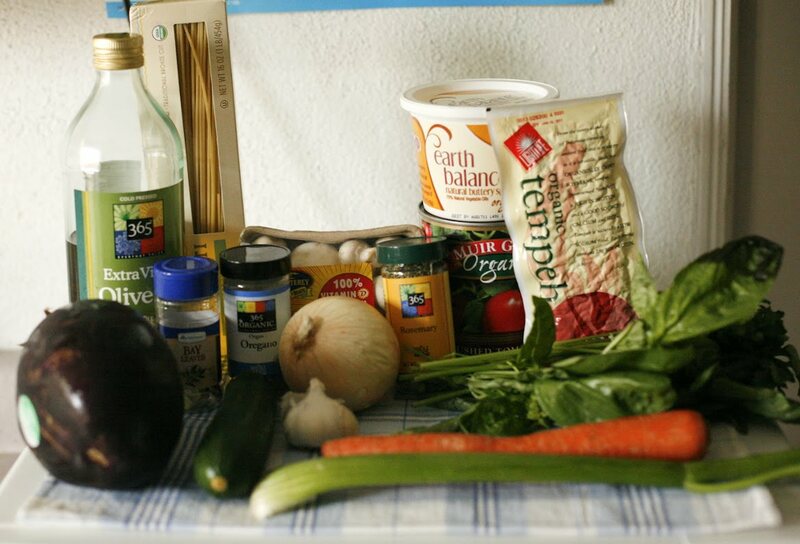 This meal is sure to be a hit with all your vegan and non-vegan friends. 1. Heat the olive oil over medium heat in a large, heavy saucepan. 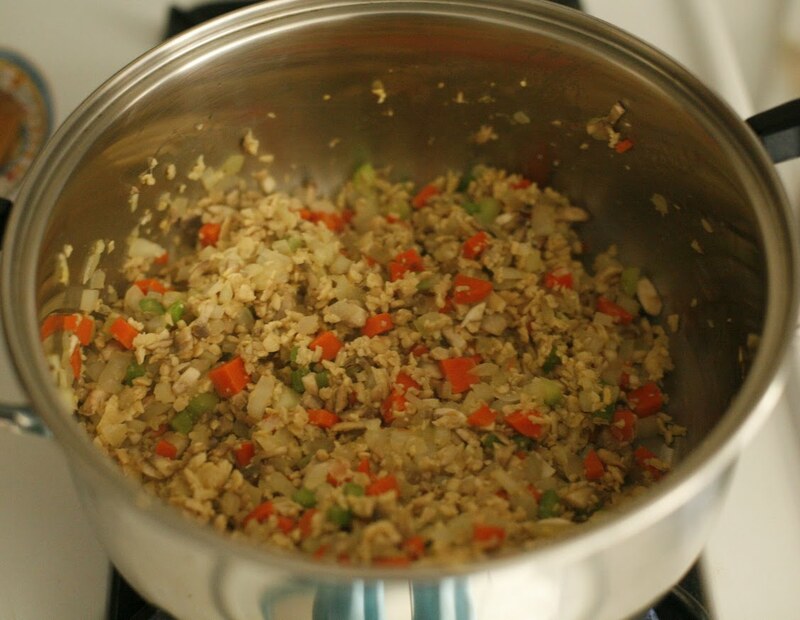 Add the garlic and saute until fragrant or about 30 seconds. 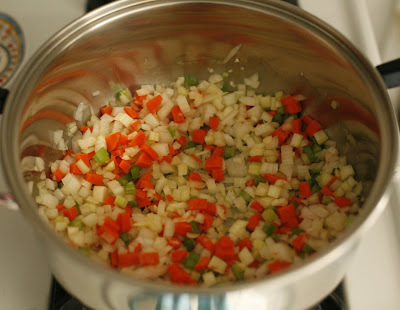 Add the onions, carrot and celery and saute about 5 minutes, stirring occasionally. 2. Add the mushrooms and tempeh to the pan and saute another 5 minutes, stirring occasionally. 3. Add a splash or two of red wine or vegetable stock, margarine, salt and pepper and stir until evaporated, about 5 to 8 minutes. 4. 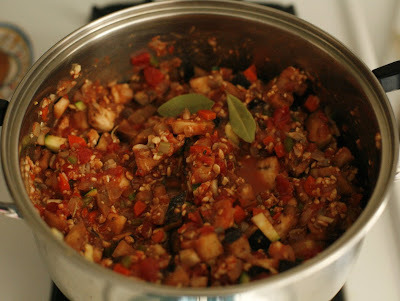 Add the zucchini, eggplant, tomatoes, bay leaf, oregano and rosemary and stir. Bring to a simmer, reduce heat to medium-low and cook uncovered until vegetables have softened, about 20 to 30 minutes. 5. Turn off heat, remove bay leaf and stir in the chopped basil and parsley. 6. To serve, divide hot pasta noodles among 6 deep bowls. 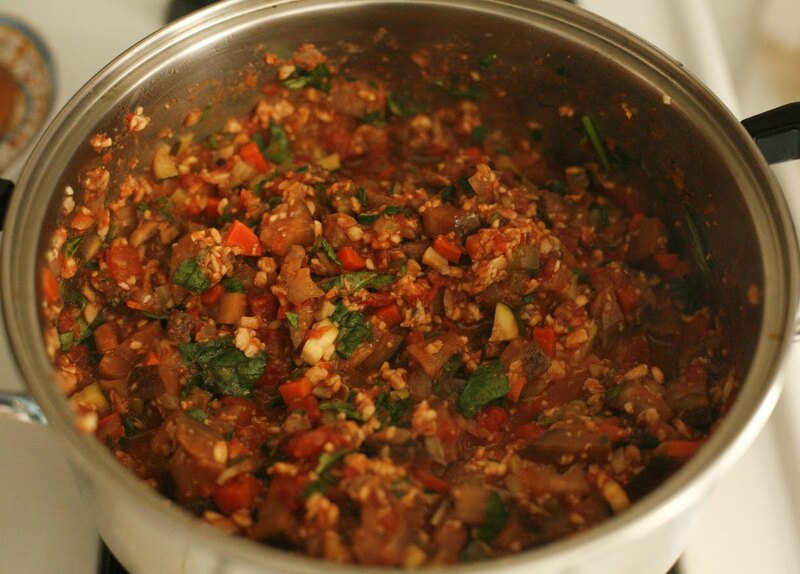 Pour a ladle or two of bolognese over the noodles and enjoy! This looks great! So hearty and satisfying. I love the addition of eggplant. I'm with you; I prefer tempeh crumbled, or sliced very thinly, to chunks. I feel like I might prefer tempeh crumbled, too. So far, I just can't get a good taste for it and it's always been in chunk or strip form. I also don't care for seitan in most recipes. Frozen empanadas and veggie pasta dinner.